Smart technologies are a force multiplier for public safety agencies, allowing them to serve growing populations even as public spending remains constrained. The Internet of Everything (IoE) provides the connective tissue in this evolving operational environment — not only bringing together objects embedded with electronics, software and sensors, but making them work together in the service of better policing. The IoE makes it possible to collect data and share it via the cloud, uniting disparate jurisdictions, agencies and ranks of command in positive ways. 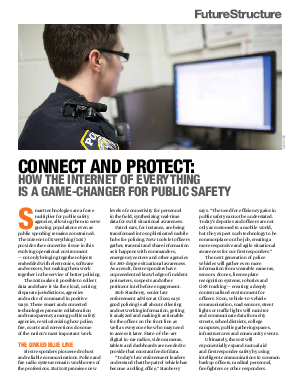 These smart and connected technologies promote collaboration and transparency among public safety agencies, revolutionizing how police, fire, courts and corrections do some of the nation’s most important work.